If you're a fan of Japanese cuisine, then you've definitely heard of the delicious octopus appetizers takoyaki. These deep fried umami blasted balls of goodness are not only excellent from the restaurant, but are also very easy and fun to make. So, how do you make them? We found some of the best takoyaki pans on the market and selected the top picks just for you. If you're looking to make some delicious takoyaki, this is your best bet. The electric Japanese takoyaki pan does it all without having to turn on your stove. Simply mix up your favorite takoyaki batter, fill the preheated cups, and watch your delicious morsels come to life! What's great about this takoyaki pan is that it is entirely self sufficient. That' means you can make delicious takoyaki without the need of a stove top. 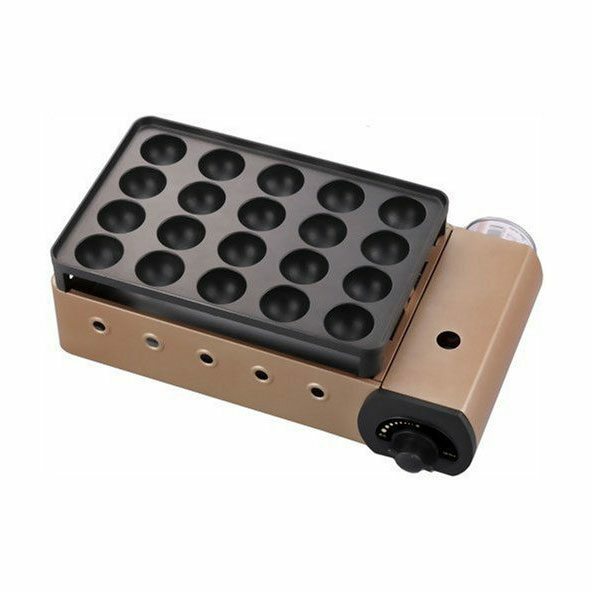 The electric takoyaki pan is great for US 110 V electric volts and has just the right amount of heat to keep your appetizers crispy and cooked. Bear in mind, cleaning is a little more difficult with this pan since the device is electronic. However, for the price and the amount of balls you can cook at once, it is definitely an excellent product. 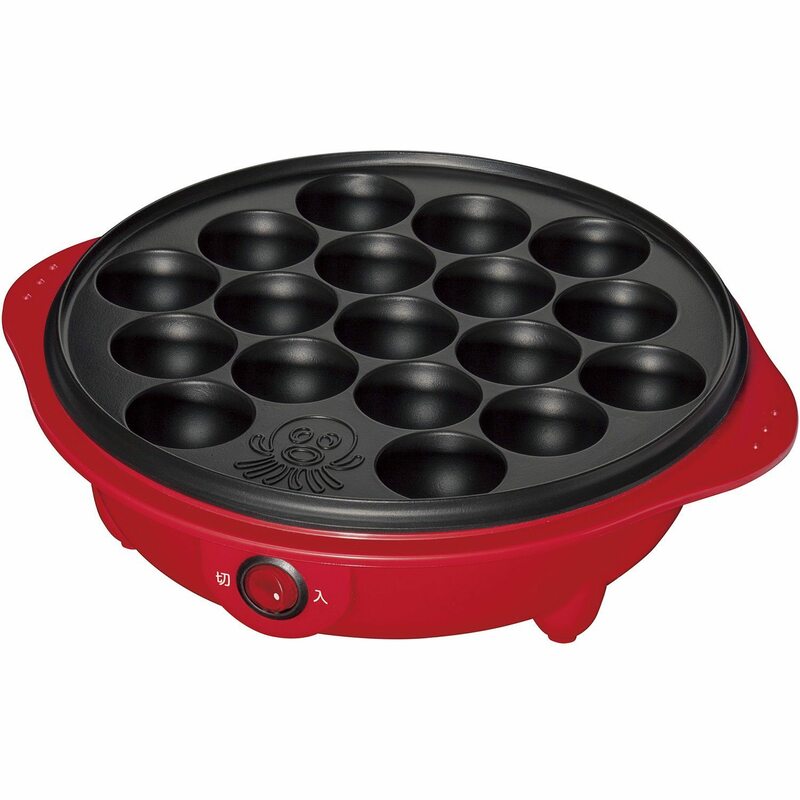 For those of you who cook on portable butane stoves, this is the takoyaki pan for you! The base of this pan has grooves that lock the pan directly into place for butane stoves. This allows for perfectly even cooking and for securing your appetizers in case of nudges and bumps. The aluminum alloy pan is coated with a non-stick surface, which is perfect for the takoyaki to cook without having broken appetizers and misshapen balls. It's so easy, the whole family can join in on the cooking fun! The pan itself is easy to clean and can be placed on the bottom rack of the dishwashers as well. Overall, it's an excellent pan for those that have a butane stove or gas stove top for cooking. If you're planning on cooking a serious batch of takoyyaki appetizers all at once, you're in for a treat. This electric takoyaki pan is powered with 800W of fury and can cook up to 24 delicious takoyaki appetizers all at the same time! That means you're getting twice the amount of food with half the time. The electric pan is coated with a non-stick surface made from fluorin resin making cooking the takoyaki easy and 100% food-grade and safe. 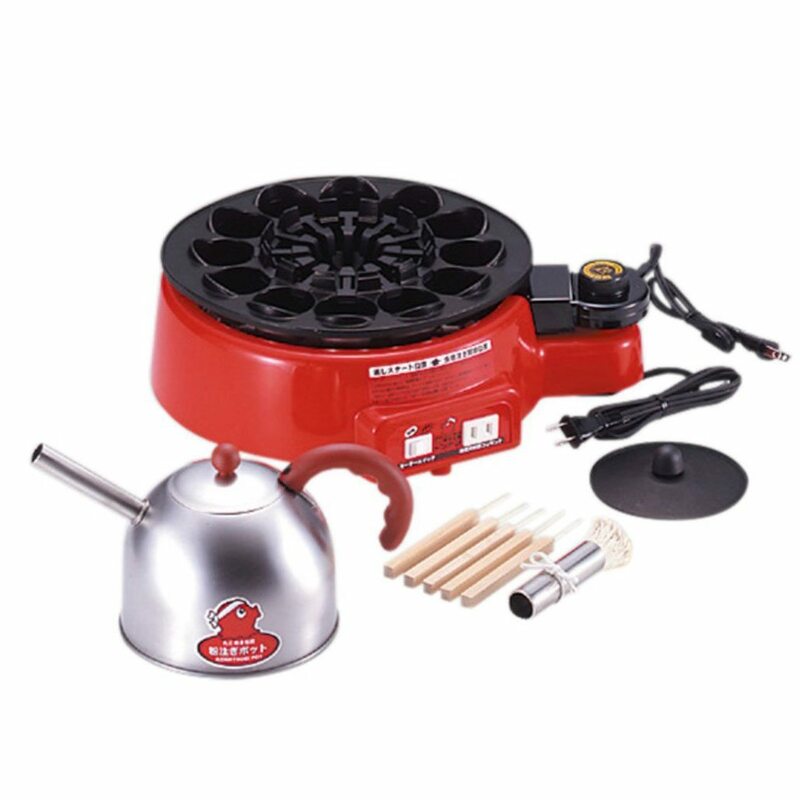 If you are in the US and using 110V, this pan works the best for that voltage. However, during our testing, we did notice that the outer four holes didn't cook as fast as the center ones, so be sure to give those a little extra time. In order to clean the pan, you can wipe it clean with a damp cloth. Overall, this is an excellent takoyaki pan for the price and functionality. Making takoyaki can be a fun feat in the kitchen with the family or just on your own. This pan is the perfect addition to your kitchen arsenal if you want to start cooking your favorite Japanese appetizer at home. One of the benefits this pan offers in the wooden handle. This ensure that you have a cool grip on the pan while cooking. Some other cast iron pans do not have a grip, so you have to use extra pot holders while cooking with those. Even though this is a smaller batch pan, the balls are more likely to cook evenly since there is less surface area to heat up. 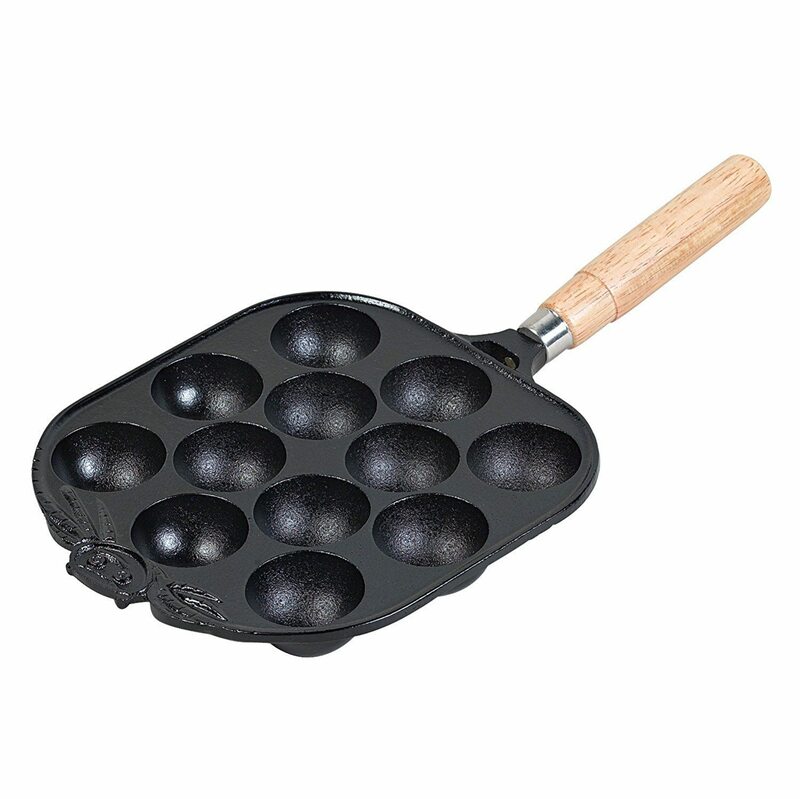 This cast iron takoyaki pan is definitely an excellent addition to your Japanese cooking. However, since the pan does not have a non-stick coating, we recomend using extra oil to keep the pan slick and prevent your takoyaki from sticking. Takoyaki is one of the most delicious traditional Japanese appetizers to eat. However, since they are fried in delicious goodness, they taste best when they are cooked fresh. 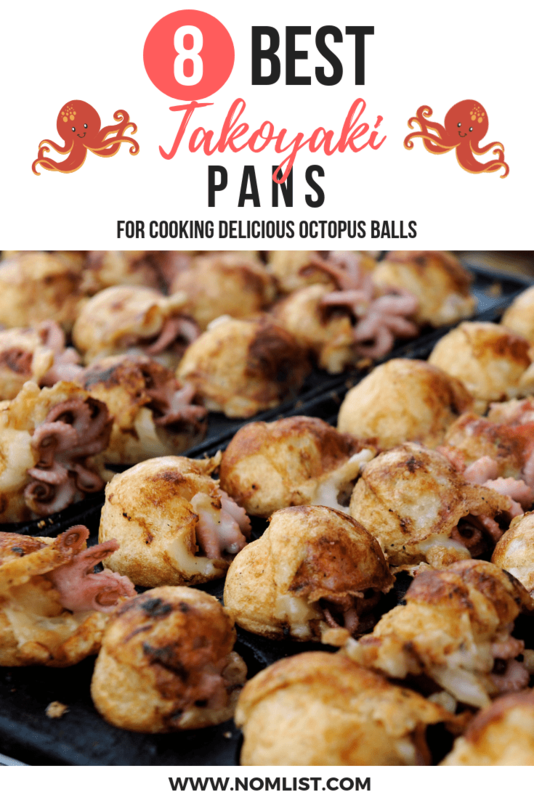 Now, you can enjoy these delicious delicacies in the comfort of your own home with these specialized takoyaki pans. Made from cast-aluminum, these pans are lightweight, durable, and heat up extremely quickly. The pan is also coated with teflon making it easy to remove the takoyaki when they are finished cooking. Also, there is a plastic coating on the handle, which makes it safe to touch when cooking. The pan itself holds up to 12 balls at a time, so you can make a serving for two quick and easy. Washing this pan is easy as it fits in the bottom rack of the dishwasher. 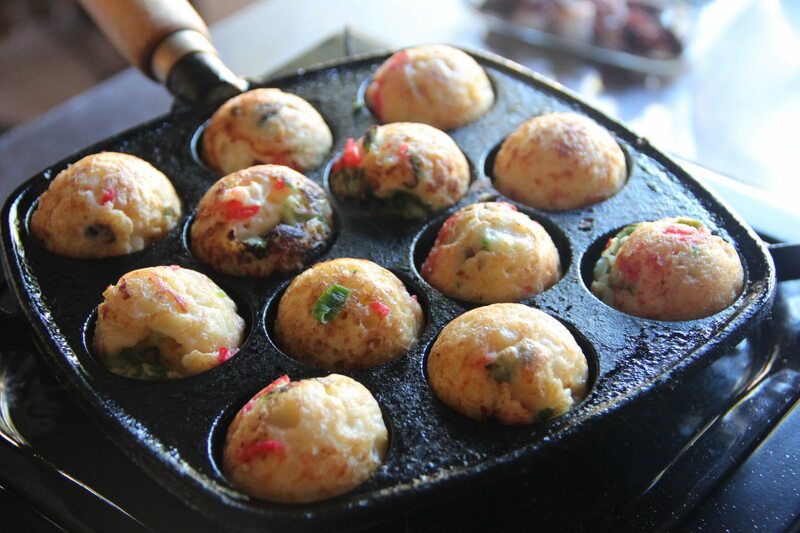 Overall, we love this simple, easy-to-use, and versatile takoyaki pan. We know you and your family will, too! Riding solo and have a craving for delicious takoyaki? This is the pan for you. Now, you can make the perfect serving size of takoyaki in the comfort of your own home. 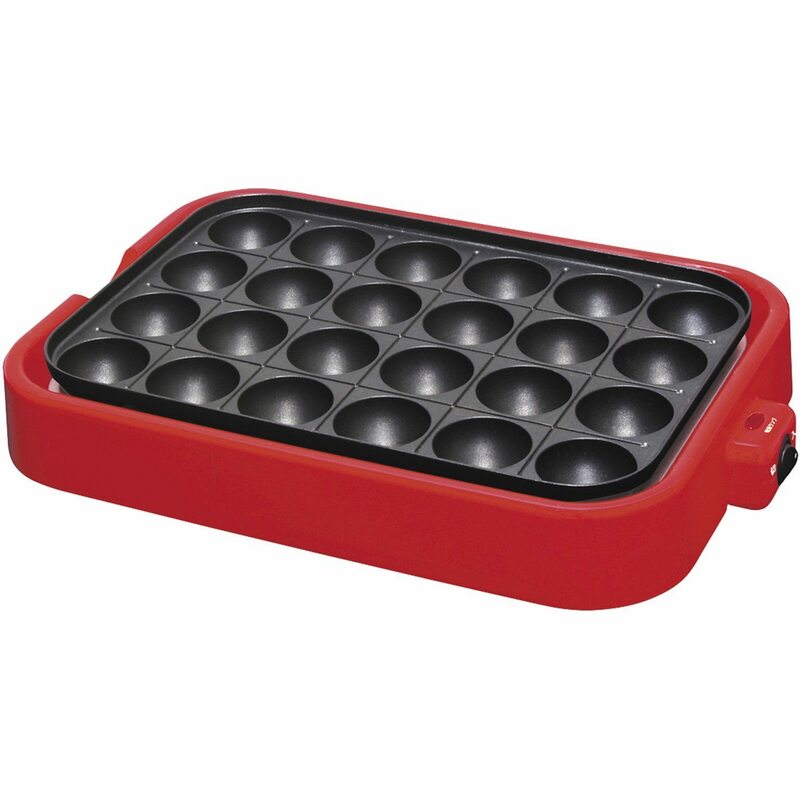 This sturdy cast-aluminum pan services up 7 delicious takoyaki balls easy as you like! One of the best features fo this takoyaki pan is the 7 1/2" handle. This ergonomic plastic handle keeps cool to the touch so you don't have to worry about accidental burns when handling. The cast-aluminum construction is lightweight and heats quickly. Also, as an added bonus, the pan includes some standard recipes to cook. All in all, this is an excellent pan for cooking takoyaki. If you're planning to cook smaller amounts or just want to make a quick snack, this is the pan for you. For those of you who need a little extra heat when cooking your takoyaki, you've found the right pan. This gas-powered pan is one of the most powerful on the market. Powered by butane cartridges, this pan gets super hot in all the places you need for even cooking. With accommodations for up to 20 takoyaki balls, you can easily mass produce your favorite Japanese appetizers quickly and efficiently. Also, the non-stick coating on the aluminum die-cast pan makes it easy to cook and remove the takoyaki without breaking them. Just a forewarning: the manual is in Japanese. However, the use is pretty easy and the machine takes standard butane cartridges purchased separately. Overall, this is an excellent high-powered takoyaki sysytem that work for at home or even in a commercial kitchen. 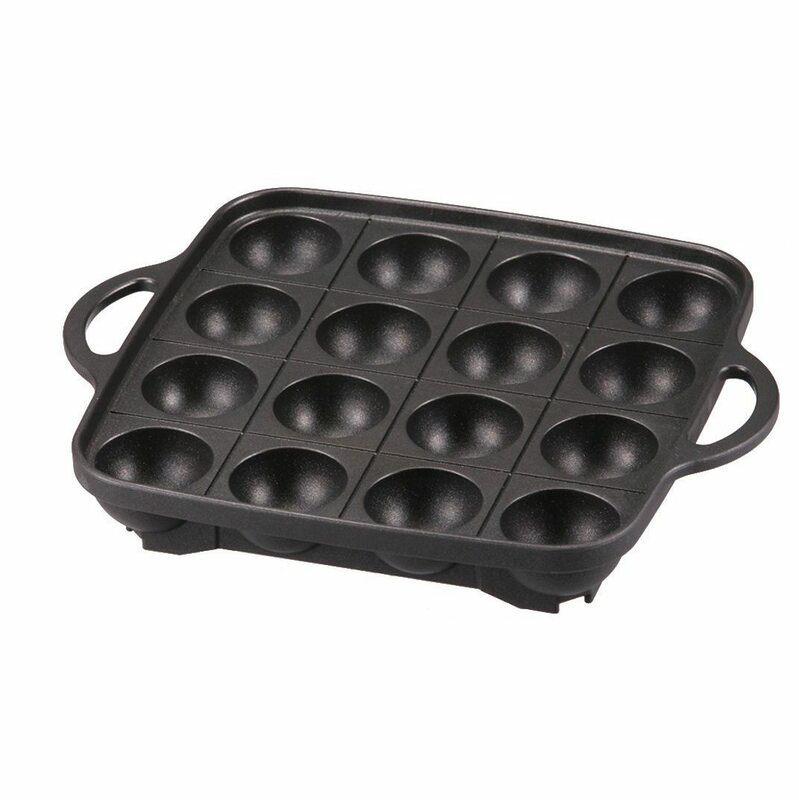 If you're planning a party or gathering and want to add a little flair to your event, this is the perfect pan for you. 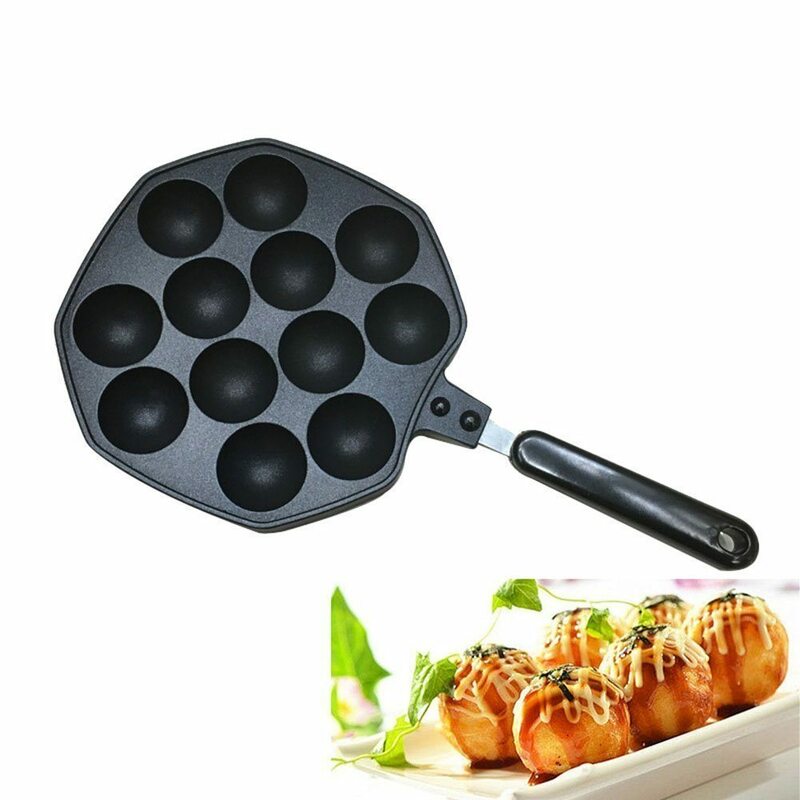 Now, you can make takoyaki cooking the center of your party's activities with this all-in-one takoyaki pan kit. The kit includes 5 brushes, a brush, a kettle, a lid, and 12 holes for cooking takoyaki and any other round pastries. The machine runs on 100V so this works well for US residents. The machine is pretty sturdy and doesn't move around easily in case of accidental nudges. The grill pan is non-stick and easy to wash with a damp cloth. We know you'll totally fall in love with this takoyaki pan. It's got everything you need to make your favorite Japanese appetizer in the comfort of your onw home.